Description: This Puffalump cow one of the first six Puffalumps made by Fisher-Price, see #8000 Puffalumps Assortment for a list of the other five first Puffalumps. She was originally sold as a white cow with a white removable dress that has three pretty pink satin hearts stitched on the white lacy collar. The dress was changed to a purple and white checkered dress in 1987. Sometime during it's three years in production, the cow was also made in pink, although the pink version was never shown in the dealer catalogues. The pink cow is quite rare, and far more hard-to-find than the white cow. FPT10179 - Large white feather light Puffalump cow that is made of extra soft parachute-type fabric. 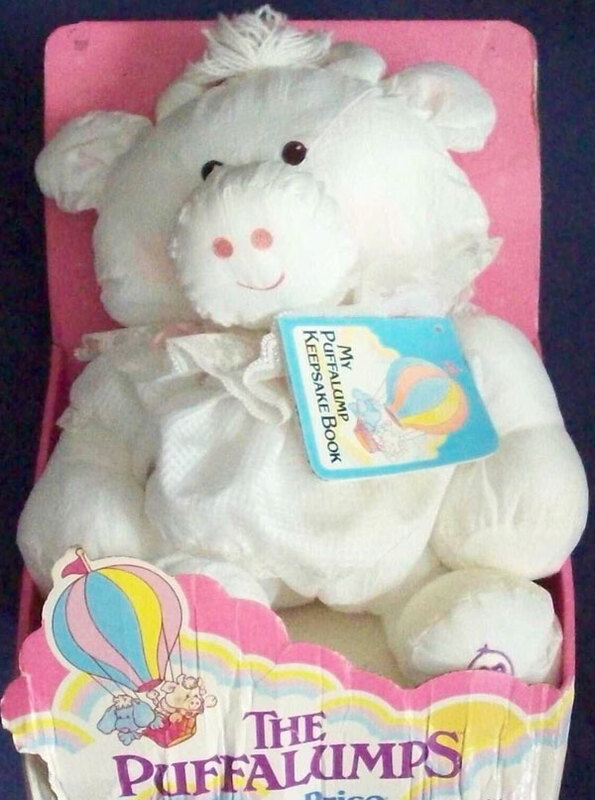 She has white yarn sprouts of "hair" on top of her head between two white stuffed "horns" She has rounded white stuffed ears, brown stitched eyes, and a rounded snout with pink stitched nostrils and a pink stitched smiling mouth. She has arms and legs with round "hooves" on the end, and the Puffalump trademark symbol on the bottom of her left hoof, click here for a photo of the symbol. *See "Variations" below. FPT10180 - Solid white satiny dress with sleeves. The sleeves and the bottom of the dress are edged in white lace trim. The dress has a wide white lace collar with three pink satin hearts stitched on the front. *See "Variations" below. 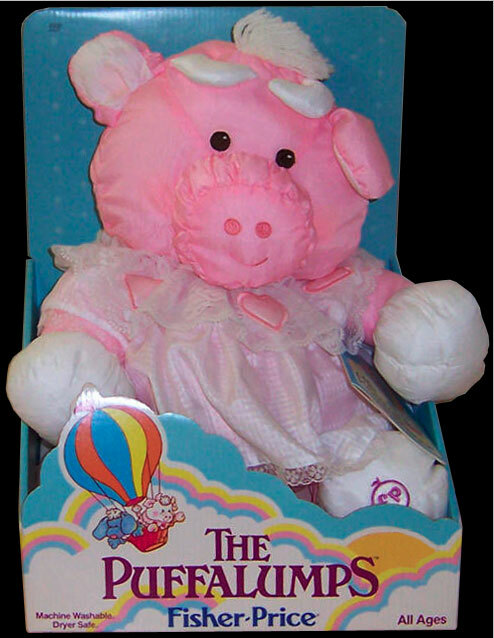 FPT10183 - Large pink feather light Puffalump cow that is made of extra soft parachute-type fabric. She has white yarn sprouts of "hair" on top of her head between two white stuffed "horns" She has rounded pink stuffed ears with white inner ears, brown stitched eyes, and a rounded snout with pink stitched nostrils and a pink stitched smiling mouth. She has pink arms and legs with round white "hooves" on the end, and the Puffalump trademark symbol on the bottom of her left hoof, click here for a photo of the symbol. FPT16768 - Large pink feather light Puffalump cow that is made of extra soft parachute-type fabric. She has white yarn sprouts of "hair" on top of her head between two white stuffed "horns" She has rounded pink stuffed ears with white inner ears, brown stitched eyes, and a rounded snout with pink stitched nostrils and a pink stitched smiling mouth. She has pink arms and legs with round white "hooves" on the end. This version has no trademark on the bottom of the foot. The pink cow wears: FPT10180 - Solid white satiny dress with sleeves. The sleeves and the bottom of the dress are edged in white lace trim. The dress has a wide white lace collar with three pink satin hearts stitched on the front. FP8001BOXA1986 - (Box Only) Sold in a 11" long, 14" high, 8-5/16" deep hands-on (non-enclosed) display box with a PINK backdrop panel. Top right corner of backdrop panel is marked, "8000 Asst.". This box has pastel colored clouds and Puffalumps in a hot air balloon on the front. FP8001SETA1986 - (Complete Set - White Cow) Complete set in original PINK display box. FP8001BOXB1986 - (Box Only) Sold in a 11" long, 14" high, 8-5/16" deep hands-on (non-enclosed) display box with a BLUE backdrop panel. Top right corner of backdrop panel is marked, "8000 Asst.". This box has pastel colored clouds and Puffalumps in a hot air balloon on the front. FP8001SETB1986 - (Complete Set - Pink Cow) Complete set in original BLUE display box. 1987 - Sold in #8020 North American Collection. 1988 - Sold in #8030 Puffalumps Assortment.